I mean, seriously, what else could the songs Cool #9 and Ice 9 be named after? Certainly not that world-ending weapon from the Kurt Vonnegut novel. They are named after the strongest in Gensokyo. 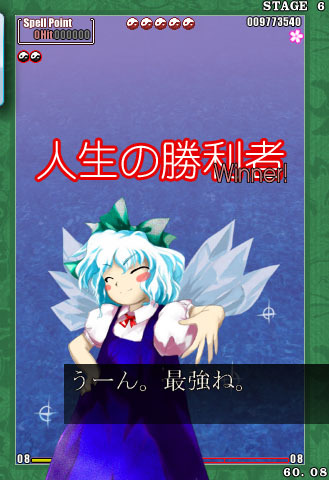 One could argue that Satriani composed these songs in the 80s and 90s, way before Cirno made her debut in The Embodiment of Scarlet Devil. But keep in mind that Satriani, like Eric Johnson, Steve Vai, and Paul Gilbert, is a space alien whose powers could very well include time travel. It’s not uncommon for musicians to journey far and wide in search of inspiration. This entry was posted on Wednesday, December 2nd, 2009 at 9:29 am	and is filed under Guitar, Toho. You can follow any responses to this entry through the RSS 2.0 feed. You can skip to the end and leave a response. Pinging is currently not allowed.